Posted by Bravado Cooking for Men in Classic Appetizers, Classic Vegetable Dishes, Recipes. Tomato plants are strange. Nothing happens for a couple of months and then they go crazy. They suddenly ripen with a frantic, almost feverish, flurry that gives you more product than you can use just as prices at the farm stand fall to their lowest point. And yet, we continue to grow them. You need to try my favorite tomato snack for this time of year when truly fresh tomatoes are available. Slather a toasted slice of whole wheat bread with mayo, add a thick slice of beefsteak tomato, a little salt and eat it open-faced. I think you will really like the following recipes for a terrific tomato olive tapenade, which can be served as an appetizer, and a garlic tomato salad that, assuming you get off your duff and make it, will become one of your all-time favorites. The garlic tomato salad is based on a recipe from the great Marcella Hazan in her book, “The Essentials of Classic Italian Cooking”. You will remember that we rated her cookbook one of the three best ever published (Go back and read about her – The Three Best Cookbooks). Her description of the recipe, which she prepared for a group of students, is typical of this wonderful book. In this recipe, you will get a chance to peel tomatoes, a skill that awes the crowd and yet is relatively easy, once you have had a little practice. Virtually nobody peels tomatoes by hand, so, by doing so, you immediately put yourself on a different plane – everyone will recognize that you are a Bravado chef. Use a swiveling vegetable or potato peeler– not a knife – to peel the tomatoes. This can be a little difficult until you get the feel of it. Pretend the tomato is like an apple. Start at the top and gently get it started. Rotate the tomato in your hand and try to keep an unbroken strand of tomato peel until you finish. You will end up with a little flesh along with the peel, but that is what we need. We have added a Bravado innovation to Marcella’s recipe. Rather than discard the tomato peels, we use them to make a tomato-olive tapenade. Put the mashed garlic, vinegar and salt into a bowl, stir well and let sit for one hour. This needs to be sitting in plain view of the guests, who you will let help finish the salad. Peel the tomatoes in front of everyone but do not discard the peels. Set them aside. Slice the tomatoes as thinly as possible with a sharp filleting knife and arrange in neat overlapping rows in the 9”x12” baking dish. Have one of your guests wash and tear the basil leaves into smaller pieces and sprinkle on top of the tomatoes. NOTE: Stop at this point and prepare the Tapenade if you wish. When ready to serve, ask one of the guests (or that special guest) to help finish the salad. 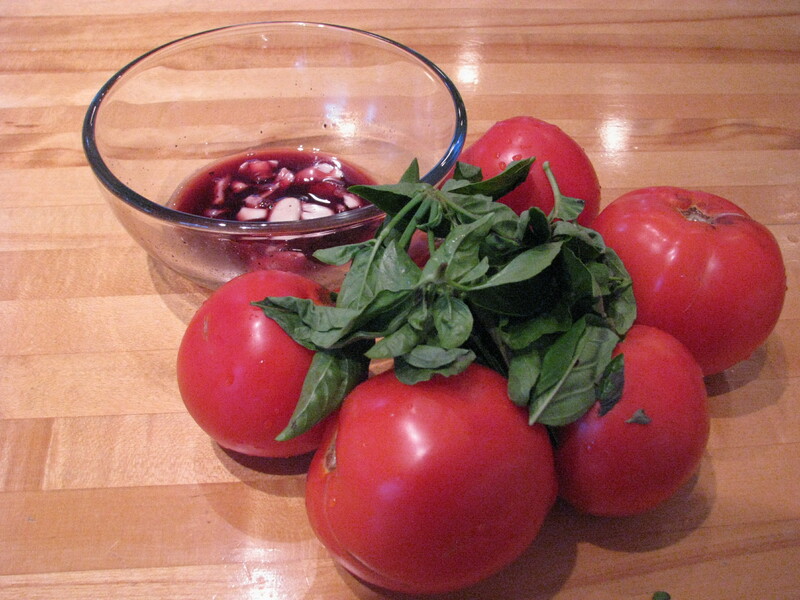 Use a slotted spoon or a strainer to remove the garlic, as pour the salt-vinegar mixture over the tomatoes. Add the olive oil, toss and serve in salad bowls with chunks of the crusty bread to sop up the dressing. It always bothers me to discard the tomato peels since most of the vitamins, minerals and other micronutrients are in the peel. It just seems like the Bravado chef should be more creative. 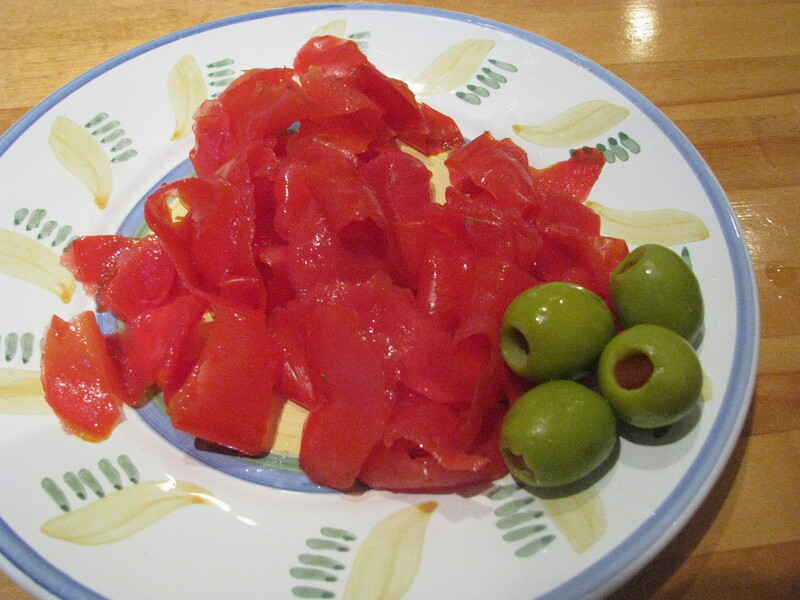 Thus, the idea for the tomato olive tapenade, which creates an appetizer that goes wonderfully with a light Pinot Noir. Notice the perfect Bravado timing. While the garlic, vinegar and salt are steeping for the tomato salad, you and your guests are quickly whipping up a wonderful appetizer and enjoying a glass of wine. After peeling the tomatoes in front of your guests, throw the peels into your food processor along with all of the other ingredients except the bread. Blend well. Serve on thin slices of crusty bread. Sit back and ponder with your guests about why people haven’t tried this before. I tried the tomato salad – it was a terrific and easy way to dress up those late summer tomatoes. Thank you! Next time I’ll try the tapenade too. Bill, I need a lesson on peeling tomatoes. I thought I knew how (parboiling for 10 seconds and then peeling with a paring knife), but your picture of the tapenade looks like you take off some of the flesh with the skin. I will give you a lesson in the Fall if you are still having problems.